18 Greetings to Communist gathering/"We're Not Going Back"
Bill de Blasio (born Warren Wilhelm, Jr.;May 8, 1961) is the Mayor-elect of New York City. Since 2010, he has held the citywide office of New York City Public Advocate, which serves as an ombudsman between the electorate and the city government and is first in line to succeed the mayor. He formerly served as a New York City Council member representing the 39th District in Brooklyn (Borough Park, Carroll Gardens, Cobble Hill, Gowanus, Kensington, Park Slope, and Windsor Terrace). He was the Democratic Party nominee in the 2013 election to become Mayor of New York City. 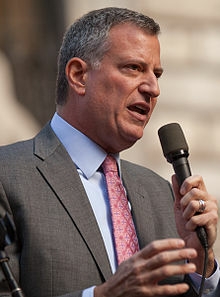 On November 5, 2013, De Blasio won the mayoral election by a landslide, receiving over 73% of the vote and will become the first Democratic mayor of the city in nearly 20 years. "De Blasio has been involved with anti-nuke groups, including being an organizer for the Physicians for Social Responsibility." Bill de Blasio toured parts of the communist Soviet Union as the Cold War raged. A de Blasio campaign spokeswoman confirmed that her boss went to the United Soviet Socialist Republic as a student in 1983. “When he was a presidential scholar at NYU, Bill attended an annual trip that took him to Lithuania and Russia. In other years, he traveled — along with other presidential scholars — to Spain, Israel and Senegal,” said de Blasio spokeswoman Lis Smith. In 1988, de Blasio went to Nicaragua to do social work in support of the Marxist revolutionary cause, the Sandinistas had been running the country for almost a decade. Their brutality was well-documented. Mr. DeBlasio, who also did fundraising for supporters of the military government, either didn't know about Sandinista repression or he didn't care. In an interview with a New York radio station, some hints emerged when he was asked about his decision to honeymoon in Cuba in 1994. Mr. de Blasio said that he doesn't excuse the "undemocratic" regime, but he also argued that it has accomplished "some good things" like "in health care." Those looking to explain away Dinkins’s failings as New York suffered from record high levels of crime and taxes, a shrinking job base, and a dangerously swollen debt, insisted that New York, with its competing ethnic identities and intransigent interest groups, was simply ungovernable. A key element in Bill de Blasio’s appeal to liberal activists and older African-Americans has been attempting to revive the reputation of Dinkins, New York’s first black mayor. The Dinkins mayoralty meant a great deal to De Blasio, who met his wife and came of age in local politics while both were working for the Dinkins administration. Dinkins, according to de Blasio, was, unbeknownst to the public, a staunch and effective crime fighter. His problem, argues de Blasio, was communications, not substance, though many who lived through the paralyzing fear of the Dinkins years would probably disagree. Talking to Salon, de Blasio gives Dinkins credit for expanding the number of cops in New York City with the “Safe Streets, Safe City” program and for bringing the great crime fighter Bill Bratton to the fore. But neither is true. It was City Council Speaker Peter Vallone who took the lead in expanding the police force. And in the wake of an out-of-town tourist murdered in Times Square, it was the tabloids—with screaming headlines like “DAVE, DO SOMETHING”—that forced the issue. Patrick Gaspard got his first taste of campaign work doing advance for the 1988 presidential campaign of Jesse Jackson, during which time his energy and affinity with local political organizations caught the notice of Harlem-based consultant Bill Lynch, whose office floor Gaspard got in the habit of crashing on. In Lynch's office Gaspard began a friendship with now New York Councilman Bill de Blasio. April 2017 Mayor Bill de Blasio bestowed special honor on his former City Council colleague, Dr. Una S.T. Clarke, and her Brooklyn-based Progressive Democrats Political Association (PDPA) at a gala ceremony commemorating the 25th anniversary of the group that was founded by Clarke. 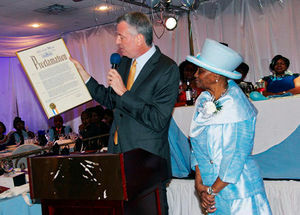 “You did something powerful that will help everyone,” said the mayor, after reading part of a New York City Proclamation declaring Sunday, April 22 “PDPA Day,” at the group’s Silver Jubilee celebrations at Tropical Paradise Ballroom on Utica Avenue in Brooklyn. Prior to bestowing the honor, deBlasio described PDPA’s 25th anniversary as “extraordin­ary,” stating that the organization has the ability to reach many. “There was a time when many doubted PDPA,” he said. “I had the honor to serve as Yvette’s Congresswoman Yvette Clarke, Dr. Clarke’s daughter] campaign chair. So, I wanted to be here to celebrate, because everyone in this room has made a profound difference. “And I must tell you, I wouldn’t be Mayor of New York City if it wasn’t for PDPA,” he added. “I want to congratulate PDPA. In the 2013 New York mayoralty race there were four significant early Democratic Party candidates. It is widely agreed that the politics of the four range from Christine Quinn, toward the right, to Bill de Blasio, to William Thompson, to John Liu on the left. Council Speaker Quinn's politics are similar to Michael Bloomberg's but still better than any of the non-Democrats. Yet her election would hardly change the direction of the city. While appealing to some because she would be the first woman and first openly gay mayor, her positions on issues go against their interests. She continually slows down and compromises all pro-working families legislation, such as holding up a vote on sick leave. She joins the Republicans in pledging to reappoint Ray Kelly as police commissioner, despite his stop-and-frisk policy. She has strong real estate developer financing. According to Danny Rubin of the People's World, Christine Quinn, Anthony Weiner, and Bill de Blasio will likely divide up the bulk of the white vote, with de Blasio getting more of the liberals. DeBlasio also has been endorsed by SEIU 1199, the city's biggest union, and could garner some additional big union endorsements and of the Working Families Party. The 2013 New York City elections were a thunderous mandate for progressive change in the nation's largest city. A broad democratic front with labor, and racially and national oppressed people at the lead, has elected a new city government on the platform of reversing the 20 years of Republican rule that preceeded it. Mayor-elect Bill de Blasio, Public Advocate-elect Letitia James, and a victorious city council progressive caucus campaigned hard, telling voters that they had the heart to fight and defeat the right-wing agenda. They received overwhelming support in response. With the 2014 mid-term elections looming, candidates throughout the state and nation who are straddling the fence or wavering in their support of working families have been put on notice. Since the historic election of David Dinkins to the office of mayor, the city has held five mayoral elections. In consecutive races the united front that elected the first African American executive was divided and conquered by an alliance of reactionary sections of the 1 percent. After two decades of City Hall catering to the now 70 billionaires and 365,000 millionaires that occupy its five boroughs, a new electoral majority has emerged victorious and ready to chart its own course for a new New York City. Bill de Blasio is mayor-elect in large part because he has the heart to challenge stop and frisk and support higher taxes on the rich. His son Dante leading the way, the campaign asked New Yorkers to reject the criminalization of poverty and to address that poverty instead. In response, a desperate Republican Party red baited de Blasio throughout the contest but the message of equality could not be stopped. De Blasio continued growing his support through election weekend despite sound trucks and front page newspaper articles calling him a socialist. Far from letting this put him on the defensive, our next mayor used each of these attacks as opportunities to clarify his commitment to social and economic justice. His popularity rose with each slander, totaling an astonishing 74 percent of the vote. Letitia James, the councilwoman from Brooklyn, won a historic campaign for Public Advocate as the first African American woman to hold that or any citywide elected office. In the primary and runoff elections James developed a diverse coalition rooted among labor and the racially oppressed and also received strong participation from liberal-leaning white communities. The James campaign also contributed to a ground-shaking mobilization in central Brooklyn that promises to change the terrain of struggle in the entire city. The largest concentration of people of African descent on the eastern seaboard sent machine candidates packing by voting their class interests. Brooklyn Boro President-elect Eric Adams and District Attorney-elect Ken Thompson, like Public Advocate-elect Letitia James, are consistently progressive African Americans and will be vital contributors to the reshaping of our city. Melissa Mark Viverito and 10 other members of the NYC council Progressive Caucus won races for City Council head to head against rightwing fronts like Good Jobs NYC and Students First, who had targeted her and other candidates favorable to the 99 percent. The two organizations were unsuccessful in defeating a single progressive candidate. Grassroots forces like Community Voices Heard (CVH) are now moving the conversation to the post election with an eye for expanding programs like participatory budgeting. They and others have plugged into initiatives like 13 Progressive Ideas for NYC (13boldideas.org), which brings together the various organizations and institutions of the peoples movement, packaging their cutting edge solutions in 13 clearly presented proposals to rebuild our city. Talking Transition (Talkingtransitionnyc.com) on the other hand is working to involve thousands of New Yorkers in an open conversation about the mayoral transition and future of the city in the process and connecting them with the above-mentioned groupings of labor and community. What we win at the ballot box can be lost at the picket line. The struggle to realize the progressive mandate and to recalibrate city government toward progressive change began Nov 6, one day after elections. Taxing the rich to fund pre-school and after school, outlawing racial profiling, significantly increasing the minimum wage, ensuring retroactive pay and contracts for public workers, ending infill and privatization attempts in public housing, ending the co-locations and privatization attempts in public education, preservation and construction of housing that is truly affordable and more are on the line. Sometimes, we must be free to disagree with Democrats on selected issues, even those whom we have supported, such as Obama on a national level, Jerrold Nadler, a progressive Congressman from Manhattan, and Bill De Blasio, who is New York City's new progressive mayor. For example, we should be free to advocate a general reduction of our country's military and to disagree with the Obama Administration's expansion of some sections of our military forces. New York City’s first Muslim club is looking to have an impact on the mayor’s race. And organizers of the group, the Muslim Democratic Club of New York, cited current Mayor Michael Bloomberg’s policies–notably, the city police department’s controversial Muslim surveillance efforts–as a key motivating factor as they seek to ensure his successor follows a new path. Representatives for New York City Council Speaker Christine Quinn and former comptroller Bill Thompson and Public Advocate Bill de Blasio were also in attendance. Robert Jackson of Harlem, the only Muslim member on the New York City Council, spoke to the crowd. So did Zead Ramadan, who is also Muslim and is one of the candidates running this year to replace Jackson. Dante de Blasio and his dad , democratic mayoral candidate , Bill de Blasio at the Gramsci monument in the Bronx. We all listened to a lecture by Frank Wilderson. — with Rose-Alma Lamoureux, Nichole Shippen and Kazembe Balagun in Boogie Down Bronx. In November 2013, Strode into Al Sharpton’s Harlem headquarters, DeBlasio also spoke of having a “not only progressive, but aggressive agenda.”. In November 2013, Mayor-elect Bill de Blasio announced the appointment of his 60-member transition committee, and it includes 10 individuals with experience in education and children's issues. The group includes parent leader Zakiyah Ansari, advocacy director of the Alliance for Quality Education. Ansari was a frequent gadfly throughout Mayor Michael Bloomberg's tenure on issues of school choice, charter schools and parent engagement, among others. The Brooklyn mother has eight children, all of whom either attend or graduated from public schools. She's also been a vocal advocate for additional state educational aid and for early childhood education, a central theme of de Blasio's campaign. Alexa Aviles, a co-PTA president at Brooklyn's P.S. 172 who is also a program officer at Scherman Foundation, which funds the arts. Maxine Griffith, will Executive Device President and Special Advisor for Campus Planning at Columbia University. Richard Buery, President and C.E.O. of the Children's Aid Society. David Jones, president and C.E.O. of the Community Service Society of New York. Kim Sweet, Executive Director of Advocates for Children of New York, which has fought to help children with special needs in the city's public schools. Dr. Marcia Keizs, President of York College at CUNY. Elba Montalvo, Founder, President and C.E.O. of the Committee for Hispanic Children and Families. de Blasio appointed Jennifer Jones Austin, a former deputy commissioner with the Administration for Children's Services, as co-leader of his transition team. WNYC reached out to some of the newly appointed members and was told they were asked to decline media requests for comment. "It's a group of people who share a progressive vision for the future of the city, who are known in their fields of endeavor as being effective and strong leaders, and who share a clear commitment to diversity in leadership for the future of the city," De Blasio said. In 2014, at Chelsea Piers, North Star Fund held its annual Community Gala. This 35th Anniversary Community Gala was a spectacular celebration of North Star Fund and the achievements of our diverse community of philanthropic and grassroots activists and organizers. The event raised $870,000, which broke every previous record. Notable guests included Mayor Bill de Blasio and First Lady Chirlane McCray, Katherine Acey, Nisha Atre, Martha Baker, Andrea Batista Schlesinger, Jay Beckner, Ingrid Benedict, Bill Bragin, Peter Brest, Art Chen, Bobby Cohen, Joe Conason, Larry Condon, Anne Delaney, Maddy deLone, Deni Frand, Elizabeth Gilmore, Elspeth Gilmore, Mark Green, Gary Hattem, Pierre Hauser, Michael Hirschhorn, Sarah Kovner and Victor Kovner, Dal LaMagna, Josh Mailman, Christine Marinoni, Christina McInerney, Pam McMichael, Ruth Messinger, Cynthia Nixon, Shola Olatoye, Ana Oliveira, Erica Payne, Lisa Philp, Mark Reed, Rinku Sen, Tani Takagi, Elizabeth Wagley, Michael Waldman, Maggie Williams, Barbara Winslow, and Kyung Yoon. Many high-power politicians–United States Senator Charles Schumer, Mayor Bill de Blasio, Council Speaker Melissa Mark-Viverito, Public Advocate Letitia James and State Senator James Sanders–fired up a hundreds-strong crowd of supporters of the labor-backed Working Families Party 9/9/2014 with speeches vowing to keep Republicans from controlling the State Senate, to raise the minimum wage, to create a public financing system for state elections and to organize low-paid fast food and airport workers. The crowd, a mix of union members and activist groups like Vocal-NY and New York Communities for Change, crammed into the basement of Manhattan’s Saint Vartan’s Armenian Cathedral for the event, entitled “Justice for Workers.” The evening started with a reading by poet Maria “Mariposa” Fernandez, who read a piece detailing the difficult life of a Hispanic service worker that simultaneously railed against pollution, an America “ruled by warmongering men,” “U.S. colonialism and imperialism” and the Atlantic slave trade. The goals laid out are ambitious, and Gov. Andrew Cuomo has sometimes wavered on whether he will support all of the party’s liberal initiatives. 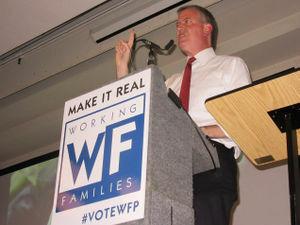 Mr. de Blasio–one of the earliest supporters of WFP, and who brokered the deal that secured Mr. Cuomo its endorsement this year–pointed to his struggle to attain the mayoralty last year as a source of inspiration. The distinguished members of the honorary committee include: Mayor Bill de Blasio, Gale Brewer, Manhattan Borough President; Ruben Diaz, Jr., Bronx Borough President; Senator Kirsten Gillibrand; Carmen de Lavallade and the late Geoffrey Holder; Fernando Ferrer, Vice Chairman, MTA and former Bronx President; Ruth Messinger, President, American Jewish World Service; Senator Charles E. Schumer and Reverend Al Sharpton. The Gala honorees include: Helen LaKelly Hunt (Changemaker), Dr. Edison O. Jackson (Trailblazer) and R. Rick Baker (Champion). Robert Sargent Shriver was honored posthumously. 21st Century Democrats successfully endorsed Bill de Blasio for New York mayor in 2014. Greetings to Communist gathering/"We're Not Going Back"
March 2015, a crowd of New Yorkers lined up at the security desk in order to make their way up to the third floor to Melba's Restaurant and the annual "We're Not Going Back" celebration of African American culture and struggle. 2014's guest speaker was Angela Davis, and the occasion was held downtown at the Henry Winston Unity Hall. This year's featured speaker was the newly elected mayor of Newark, the Honorable Ras Baraka. The meeting's theme was "Support City Officials Who Fight for Equality, a Living Wage and Against Racism." Estevan Bassett-Nembhard, New York organizer of the Communist Party USA, opened the program, greeting the over 200 participants and emphasizing the need for unity in the vital struggle to end racism. "We stand on the shoulders of those who defeated slavery and Jim Crow. Our history tells us that united we stand and divided we fall." He continued, "We're not going back! Our pledge is to stick together." Naquasia LeGrand chaired the event, winning a round of applause when she announced that she was a fast food worker and an organizer of that movement. A large and politically diverse host committee was formed to welcome Mayor Baraka, including representatives from labor, fast-food workers, police reform, immigrant rights, LGBTQ, religious and peace and justice movements. Among them were Alisha Garner, the sister of Eric Garner murdered by police on Staten Island, and elected officials including State Senator Bill Perkins, State Assemblyman Keith Wright, along with a representative of City Council member Ydanis Rodriguez. Baraka received proclamations from Perkins, Wright and Rodriguez. He also received a letter of welcome from Mayor Bill de Blasio. Manhattan Borough President Gale Brewer stopped by briefly to greet the gathering crowd. As the evening ended one participant said, "This was a great event that showed that left and center forces in our city can work together to build principled unity and a stronger movement to help defeat racism and poverty." New York City: October 5, 2017, the Asian American Federation held a rally at Trump Tower with our member agencies and leading immigrant advocacy groups to speak out in support of Asian American Deferred Action for Childhood Arrivals (DACA) recipients, who are being impacted by the dissolution of the DACA program under the Trump administration. Twenty-three organizations and nearly 200 New Yorkers, including Congresswoman Jo-Ann Yoo, executive director of the Asian American Federation, Grace Meng, Council Member Margaret Chin, Assemblymember Yuh-line Niou, Manhattan Borough President Gale Brewer, and Comptroller Scott Stringer, Senator Kirsten Gillibrand, Rep. Nydia Velazquez, Mayor Bill de Blasio Assemblymember Deborah Glick, Assemblyman Ron Kim, Assemblywoman Nily Rozic, Public Advocate Letitia James, Council Member Daniel Dromm, Council Member Rory Lancman, Steven Choi, executive director of the New York Immigration Coalition, Margaret Fung, executive director of the Asian American Legal Defense and Education Fund, Christopher Kui, executive director of Asian Americans for Equality, Annetta Seecharran, executive director of Chhaya Community Development Corporation, Mae Lee, executive director of the Chinese Progressive Association (New York), Wayne Ho, executive director of the Chinese-American Planning Council, Kavita Mehra, executive director of Sakhi for South Asian Women, Robina Niaz, executive director of Turning Point for Women and Families, joined hands with the Federation to defend the future of our DREAMers. Rally Co-Sponsors: Adhikaar, Alliance of South Asian American Labor, Arab American Association of New York, Asian American Arts Alliance, Asian American Bar Association of New York, Asian American Legal Defense and Education Fund, Asian Americans for Equality, Chhaya Community Development Corporation, Chinese-American Planning Council, Chinese Progressive Association (New York), Council of People’s Organization, Desis Rising Up and Moving, Japanese American Association of New York, Japanese American Social Services, Inc., Korean American Family Service Center, Korean Community Services of Metropolitan New York, MinKwon Center for Community Action, National Queer Asian Pacific Islander Alliance, New York Immigration Coalition, OCA-NY, Sakhi for South Asian Women, Turning Point for Women and Families, University Settlement. This page was last modified on 16 January 2019, at 19:45.